As students share words about friendship they are entered into a wordle. After the wordle is displayed the following questions are posed. Can animals and people be friends? Can pets have the qualities that are listed in our wordle? Students work in groups with a copy of the wordle and circle the most important qualities a pet (who is a friend) can have. Each group shares their selected words and justifies their choice. List words that describe a cat’s behaviour and attitude towards people. Talk about how cats are different from other pets such as dogs. Do you think you can train a cat? The cover is discussed. Where is the boy and the cat? How would you describe the expression on the cat’s face? The boy’s face? Teacher reads the story to whole class. The story is discussed with reference to the words that have previously been discussed that describe friendship. The wordles are revisited and the qualities of friendship applied to the story. Nicholas is a good friend because . . .
Cat is a good friend because . . .
A new wordle is created by brainstorming words to describe Nicholas and cat. This is shared and compared with the friendship wordles. In small groups a venn diagram is created with the common words placed in the intersection of the two circles. Complete the activity by making a class venn diagram using a interactive venn diagram. Students draw a scene from the story and write 4 key words that reflect the strength of Nicholas and his cat’s friendship. Words may be chosen from the wordles and venn diagrams to describe the scene chosen by the students. Students share their work in groups. Work is displayed on the wall with the wordles. Before this session display the drawings done in the last assessment task. Students complete a print walk. Remind students to read the descriptive words around their drawing. Students share their drawings and justify their scene and word choices. Watch the book trailer. The book trailer suggests some of the themes in the book: friendship, bravery, fear. Discuss these themes as a group. Talk about the ending. Nicholas thinks the cat is brave: Safe in bed again, Nicholas remembered his cat on the roof, unafraid of the dark night things. The cat thought Nicholas must be a very brave boy. Discuss who was brave and what each of the characters will think about the adventures in the morning. Interacting and relating to an image. Who is sitting close to me? Who is sitting half way down the room? Who is at the back of the room? How can we look at people and objects? Guided by the teacher, students explore the angles created by the illustrator to position the reader within the text. Students trace the angles that illustrate the contact Nicholas and cat are making. Students in pairs mimic the angles e.g. the cover is face to face, pages 1-4 looking up, page 10 looking down. Students explore the text and describe the feelings the reader has when viewing the nominated pages in the text e.g. Cat leaping down into Nicholas arms. Nicholas gazing down at Cat. Think back to the major themes discussed after watching the book trailer. With groups of three using an iPad or other device, ask students to take photos of each other posing using selected angles from the text, e.g. face to face. Each group shares their photos and explains the angle and the feeling that it evokes. Examples of photos from different angles are printed, labeled and added to the class wall with other work from this unit. photos, discussing the feelings they evoke. Choose pages from the text with the same angles as work samples on the print wall. Relate this structure to Come Down, Cat! by rereading the text and identifying the three major parts. Discuss how the angles in the illustrations are used in each part of the narrative. Which words or sounds does cat make or say? Explore the different meanings of ‘marl’ related to the place in the story where it appears. What other sounds do cats make? Write words in a wordle. Watch the YouTube video of cats. Write any new descriptive words in the wordle. What do the different sounds mean? Display the work on the unit wall. Revisit the structure of a narrative. Put students in small groups each allocated a section of the text. Each group lists the key events for their allocated section of the text: orientation, complication or resolution. Observe the discussions, noting if the groups use the illustrations as well as the text. Have each group report back and discuss after rereading the text. Students take part in a print walk to highlight the learning covered so far. Students volunteer to share their work samples. 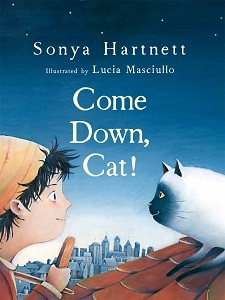 With the teacher, students co-construct a story map of Come Down, Cat! Using the text, students work in groups to decide the six most important parts of the story. The selected parts are marked with a sticky note. Students justify their choices by discussing the key element of the part selected. Students gather and each group shares their pages and justifies their choice. A class discussion comes to a consensus and the appropriate pages are noted on the story map. While choosing the key scenes the teacher and students discuss the interaction of words and pictures and discuss the reason why on one of the last pages there are no words. The story map is divided into six squares and each group recreates the selected event in words and pictures. Students use some of the sounds made by cat with the appropriate expression. The story map is assembled and displayed. Students are given at least six blank squares of paper. The task is to retell Come Down, Cat! This can be done by making a flip book. Have students list the key events they have selected then prepare the squares for the flip book. When assessing, look for the main event, any details added and sequencing. Anstey, M.& Bull, G. (2000) Reading the Visual: Written and Illustrated Children’s Literature. South Melbourne. Cengage. Callow, J. (2013) The shape of texts to come: How images and texts work. Marrickville, N.S.W. primary English Teaching association (PETAA). Exley, B & Kervin, L. (2013) Playing with Grammar in the Early Years: Learning about Language in the Australian Curriculum: English. Australian Literacy Educators’ Association (ALEA). CARMEL TURNER has spent over 30 years in primary schools with her last position being principal. During that time Carmel worked within various literacy programs with her Diocese and held the role of Literacy Facilitator. Five years ago Carmel joined the Australian Catholic University and lectures in many education subjects including Children’s Literature for Literacy. Carmel’s area of research is the use of Postmodern Picturebooks in the development of critical literacy.